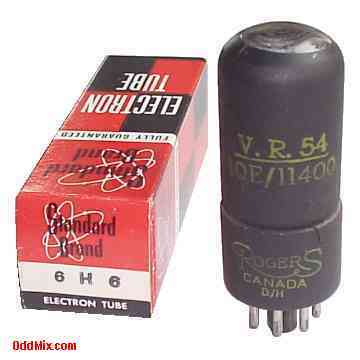 This is a genuine, original Rogers V. R. 54 10E/11400 - 6H6 equivalent Twin Diode electronic tube. A collector's special shielded glass vacuum tube. Developed for detector or low-voltage rectifier use in receivers. Excellent for those antique radio and television restoration projects or to set up a private vacuum tube museum. It is a NOS tube - New Old Stock, unused, boxed, excellent condition. Only one of this rare, historical vacuum tube available!